Yesterday, Moto Guzzi unveiled in Cologne a new 1200 Sport 4V with the most powerful version yet of the 4 valve engine, along with styling and design tweaks. Classic Guzzi style with modern engine performance is promised. 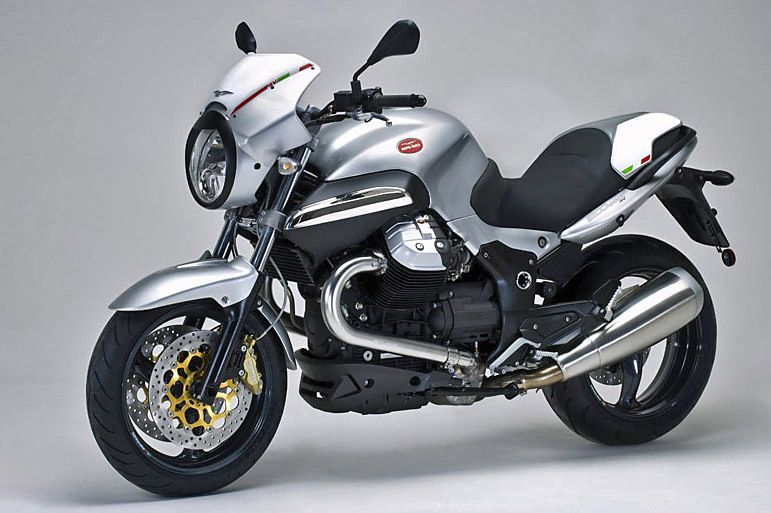 Here is what Moto Guzzi has to say about this bike. The look we already know but the 105 CV of “grunt” from the “Quattrovalvole” engine is all new. The power delivery is silky smooth and, on the open road, the bike’s true sports character shines along with numerous technical innovations and a new sense of style. The new “over and under” exhaust system communicates the innate power and innovation of the engine as does the new triangular base of the silencer and the new clear rear lamp cluster. Better performance ensures that the new 1200 SPORT 4V will become an icon for riders seeking real sports performance, not just show. Good taste is assured by the style that gives this Moto Guzzi its character. This style can be seen in the screen and the saddle that house racing number plates like competition models, it can be seen in the white-faced instruments, in the Brembo Gold Series brakes and in the set-back aluminium footpegs. Although the new Moto Guzzi 1200 SPORT 4V has a decidedly sports type set-up, it is also an excellent tourer with every detail well designed for the rider and pillion passenger to travel in the utmost comfort. The saddle is well padded and offers great support, weight distribution is ideal and with a low centre of gravity, the 1200 SPORT 4 V can easily change direction very quickly on those twisty roads that offer the rider such satisfaction. The superb handling is due to the exceptional rigidity of the twin cradle steel frame, the forks and the fully adjustable shock absorber that guarantee both comfort and excellent road holding. Those of you that go touring will really appreciate the protection offered by the windscreen and how this sports bike so easily becomes a real Grand Tourer complete with heated hand grips, panniers, top box and satellite navigation system. No matter the speed, the brakes provide very wide safety margins and consist of twin 320 mm discs with radial mounted four-piston calipers at the front and a single 298 mm disc at the rear. The brake sizes are the same on the ABS version. In classic black or elegant titanium grey, the 1200 Sport 4V also stands out with its subtle green, white and red stripe that celebrates the bike’s Italian heritage.